5280 Paddle Sports exists to serve the Denver Metro Community with Stand Up Paddleboarding activities and to advocate the sport of SUP. Stand up paddleboarding (SUP) is without a doubt one of the best forms of cross training as it works the core, legs and upper body all at the same time - plus it’s tons of fun! 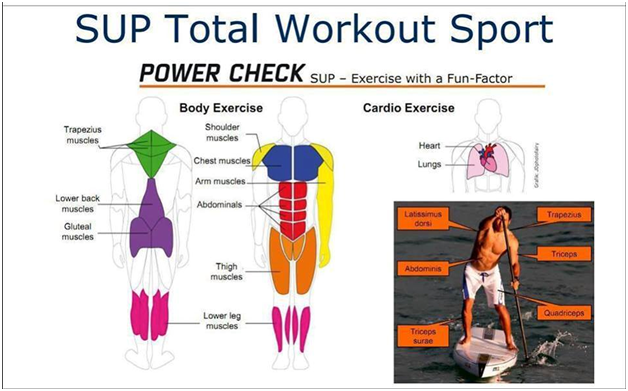 SUP delivers a full body workout and thus has become an extremely popular cross-training activity. And since you stand at your full height, you can enjoy unique views of the surrounding beauty. The Hawaiian phrase "Ku Hoe He'e Nalu" simply means: to stand, to paddle, to surf, a wave. The popularity of the modern sport has its origination in the Hawaiian Islands. It's most recent history dates back to the 1960's when the Beach Boys (Surf Instructors) on Waikiki beach would stand on their long boards and paddle out with outrigger paddles to take pictures of the tourists learning to surf. This is where the term "Beach Boy Surfing" originates. It also allowed them to have better visibility over their group of Surfing Instructors and allowed them to call the sets easier as their upright position meant that they could see the swell long before the prone surfers. As time moved on board designs and fashions changed, the paddle was all but lost in the history of surfing. 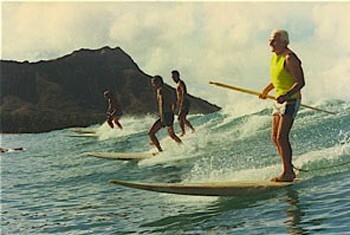 A few surfers in Waikiki continued to use a paddle but they were very much in the minority. In the early 2000’s Hawaiian surfers such as Dave Kalama, Brain Keaulana, Archie Kalepa and Laird Hamilton started SUP as an alternative way to train while the surf was down. They were discovering Stand Up Paddle Surfing allowed them to keep in shape for the bigger days of tow in surfing as well as adding a new dimension to their skills. As the years went on they found themselves entering such events as the Molokai to Oahu Paddleboard Race and Makaha’s Big Board Surfing Classic. Now you can find many SUP paddlers entering Outrigger and Paddleboard events as participants in their own category. One difference between the modern idea of surfing and SUP is that the latter does not need a wave. In SUP, one can paddle on the open ocean, in harbours, on lakes, rivers or any large body of water. In Hawaii they call it "Surfing with Aloha."